Jeremiah Trotter Jr. and his father, former Eagles linebacker Jeremiah Trotter. His movements are consciously measured. Jeremiah Trotter, the beloved former Eagles’ linebacker, likes to keep his distance, though through the corner of his eyes he watches like a hovering papa hawk. Not too close to cast an overbearing shadow, yet far enough to see and hear. What Trotter is watching unfold, what he’ll see the next few years is a reflection of himself—a better version admits No. 54, the four-time Pro Bowler and 11-year NFL veteran who was an anchor to the great Eagles’ teams of the early-2000s. 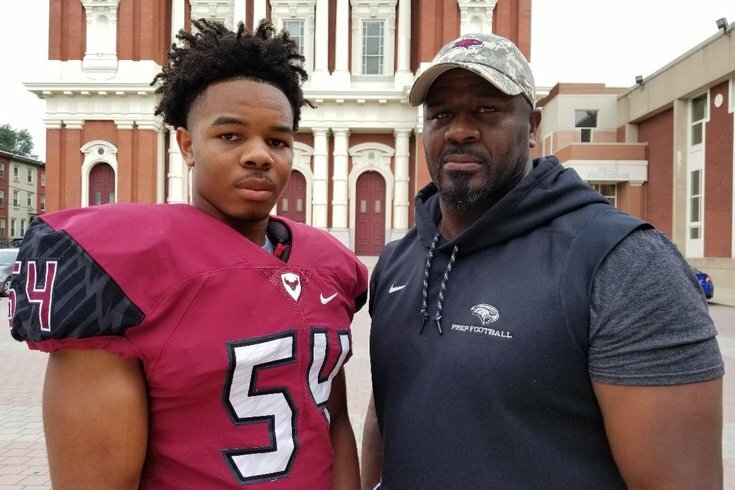 What the rest of the country will soon find out about is his son—Jeremiah Trotter Jr., a stoutly built 6-foot-1, 201-pound starting sophomore outside linebacker for St. Joseph’s Prep, which coach Gabe Infante has made into a traditional state powerhouse and who enter this season ranked No. 18 nationally by USA Today. The Hawks finished 13-1 last year and are favorites once again to reach the PIAA 6A state finals. They’ll do so on the strong foundation of players like Jeremiah Jr. and fellow sophomores like quarterback Kyle McCord, who’s already received over 10 college offers, and 6-foot-3 receiver Marvin Harrison Jr., the son of Hall of Famer Marvin Harrison. And off at a comfortable distance is Trotter, the father of three, TreMil, his 19-year-old daughter who is a freshman in college, Jeremiah Jr., who is 15, and Josiah, who is 13 and as big as his older brother now. Jeremiah Jr., who will turn 16 in December, was a baby when his father was in his prime NFL years and barely remembers his dad playing. I remember coaching Little League and you see those parents... They think ‘Little Johnny’ is the best thing since sliced bread... I try to be brutally honest with my kids. Trotter is not a Prep assistant coach. He swoops in when he can, distributing wisdom accumulated over 11 years in the NFL, and it’s interesting that he spends most of his time talking to the Hawks’ assistant coaches and to the other players on the team, rather than his own son, Jeremiah Jr.
“I try to help out when I can, and I learned a lot during my years in the NFL — and during my years in college and high school — from a lot of great coaches and a lot of great players,” Trotter said in his Hooks, Texas accent. “I didn’t want to be one of those fathers who are so hard on their kids, when their kids are giving everything that they have. When it’s time to talk to Jeremiah Jr., I’ll talk to him. “I remember coaching Little League and you see those parents that have special glasses for their kids, and only their kids. They think ‘Little Johnny’ is the best thing since sliced bread. My word is ‘honest.’ I always tried to be honest with people, and with my kids. Sometimes you get to a certain level, they’re not honest. I try to be brutally honest with my kids. I experienced a lot, and I can help him — and the other kids—even though the game has changed a lot since I played. Home. That’s where Trotter learned and grew. Myra Trotter, Trotter’s father, passed away soon after “The Axe Man” was drafted by the Eagles in the third round of the 1998 draft out of Stephen F. Austin, an FCS school that plays in the Southland Conference. It was Myra who used to wake up young Jeremiah Sr. to chop wood all day. Jeremiah would have to do his homework on the bus ride home, then rip through blocks of wood until the wee hours of the morning. Trotter made sure his children knew how tough he had it growing up. He remembers the stories his father told him about walking six miles to school barefoot in the snow, going three or four days without eating, and sleeping on a wood floor seeing chickens below through the cracks. “Even though I had it hard, I never had it as hard as my dad,” said Trotter, who now lives in Mt. Laurel, N.J. “We never had the lights turned off, we never went hungry. My dad did, sometimes for days. That’s true. But we never missed any meals. We weren’t having steak and caviar every night, but we had food on the table. Even though I had it hard, I had it way easier than my dad. I wanted to make sure my kids didn’t have to go through what I went through. Jeremiah Jr. is a soft-spoken young man who doesn’t run around beating his chest that his dad was a famous football player. Jeremiah Jr. and Josiah got to see their dad play near the of his career, though they didn’t come to the realization their father was the “Axe Man” until fairly recently. Trotter was speaking at a banquet and they showed clips of his playing career when Jeremiah Jr. and Josiah were eight and six, respectively. “When I was younger and I used to see people running up to him, asking him for his autograph, and I used to think, ‘Why, he’s my dad?’” said Jeremiah Jr., laughing. “I knew my dad played football. I think I was around 10 or 11 when I looked him up on YouTube to see how good he was, because people were always talking about him. “But I really didn’t know his life story until he was speaking at that banquet and how tough he had it growing up. That’s the first time me and my brother heard it. I couldn’t imagine growing up like he did. I’m proud of him. I remember when we were in Texas one time he drove by the house where he lived. It was back in the woods, and it was almost like a hut. It makes me feel how blessed me and my family have it. 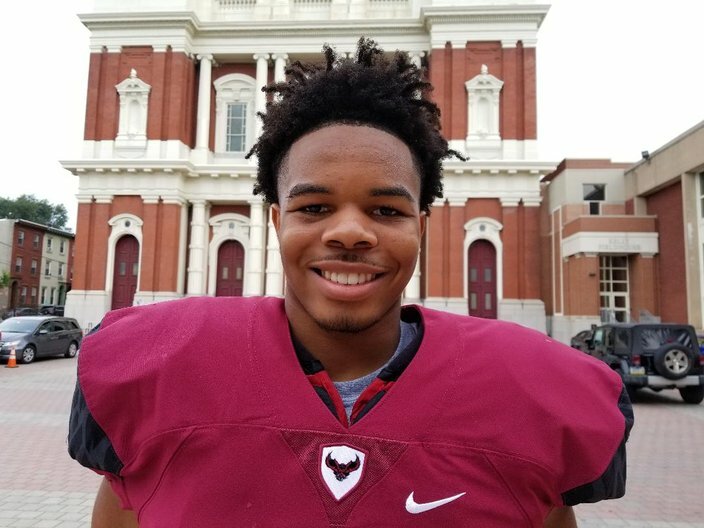 St. Joe's Prep sophomore linebacker Jeremiah Trotter, Jr.
How good is Jeremiah Jr.? Trotter played at 6-2, 265. Jeremiah Jr. will eventually be bigger than his dad by his freshman year in college. He’s received offers from Temple, Syracuse and Maryland, with Penn State very interested, and the number will undoubtedly grow by the time he’s a senior, when he could be one of the most sought-after recruits in the country. “I don’t get caught up in the offers and the rankings,” Trotter Sr. said. “I keep telling everybody that Jeremiah Jr. is better than me. He’s been better than me since he was little. What he knows about playing linebacker is stuff I didn’t know until my third year in the NFL. I didn’t have me growing up. My dad was the best dad ever, but he didn’t have the experience that I have in the NFL. I wish my dad could see this. It’s tough, because my dad never saw me play [in the NFL], and he won’t see my son. It’s why I make sure I’m there for everything my kids do. “But my biggest thing is to let him play. All of that will come. You settle your business on the football field. He’s still 15, no matter how you cut it. He’s put in 37 pounds from last year until now. It’s not just me. Tammi [Trotter’s wife] without a doubt is a big of his life. We don’t spoil our kids. There is this quote I like from an old NFL player. ‘I gave my kids everything, because I loved them. Then I took it all back, because I loved them.’ That always stuck with me. It’s why I want my kids to enjoy the journey as much as the destination. Infante says Jeremiah Jr. is probably the most complete linebacker he’s ever coached. Infante also stresses that Trotter has an objective perspective about his son, and he allows Infante to coach Jeremiah Jr.
“I appreciate Trot’s eyes for the game,” Infante said. “He was obviously a great player, but there are a rare few that see the game he way he does, too. Jeremiah Jr. wants to be great. He’s not a fat cat. He fits the mold of the kid that we’ve had. He’s right in line with D’Andre Swift and John Reid.